It seems that the better known a cocktail is, the more it resists the constricts of a recipe—as Jimmy Durante used to say, “everybody wants to get into the act.” A few of the most famous don’t even adhere to a canonical list of ingredients—for example, the Martini, which Camper English recently described as “a set of variables and constants,” rather than a single drink. The Gimlet carries this free-for-all to an extreme. As near as I can tell, the only point of general agreement about the Gimlet Cocktail is that it contains lime. The source of the lime, the proportions, the sweetener, the presence (or lack) of soda, the use of ice, the type of glass, the garnish, even the base spirit—in fact, all other attributes of the drink—are only pencilled in as opportunities for substitution. It seems that if you put three Gimlet drinkers at one bar, you’ll have to serve three different Gimlets. In the end, “Gimlet” is not a recipe; it is an abstraction, and a vehicle for self-expression. Whatever the proportions, Rose’s Lime draws the main fault line among Gimlet drinkers; either you love it, or you hate it. A large contingent of Gimlet drinkers revile Rose’s as an inferior, preserved lime juice, industrial wrong-headedness full of chem lab flavoring and corn syrup sweeteners. These anti-Rosers prefer fresh lime juice and sugar in a gin sour-style Gimlet. Others aren’t prepared to write off Rose’s so lightly. In addition to lime juice and sugar, Rose’s presents additional flavors that would be right at home in tropical or tiki recipes—pineapple and coconut are the ones I can taste most easily. It has a mystery funkiness, a Gimlet analog of the “hogo” that many consider the main attraction in some Jamaican rums. For those who pursue this flavor, Rose’s is much more than an attempt at lime juice simulation, and they like the idea of Gimlets made with something like the original flavors. But as long as we’re slicing and dicing the Gimlet demographics, we may as well look beyond the lime and Rose’s schism. There are other subgroups that add to Gimlet entropy. Many of the remaining controversies sound like they came out of a Martini argument—gin or vodka; shaken or stirred; up or rocks; garnish or not. Ah, the chaos that is Gimlet! I subscribe to the Rose’s School of Gimletry. I quite surprise myself with that revelation, since I’m a knee-jerk fresh juice person, but Rose’s just seems to make a more interesting, flavorful cocktail. Stir with ice until well chilled; strained into a chilled cocktail glass, no garnish. The lime juice-based version is just too simple for my taste, and too bland—the drink just lacks character, flavorwise. The Rose’s version is more complex, and more interesting, and if I’m drinking Gimlets, that’s the version I want. And yet, that funkiness is only welcome for awhile, and then it’s time to go on to the next thing. And so, with all its degrees of freedom and opportunities to let every Gimleteer take ownership of its design, it comes down to the question of whether the Gimlet can stand up to its competition. Suppose we wanted to dress it up a little, to put a little more “there” there. Since we’re working with such a hand-waving set of guidelines anyway, let’s start with the lime juice version, and see if we can make it more memorable. Taking another path, we could try gin, lime juice, perhaps some bitters to give it a little depth, maybe a more flavorful sweetener than simple cane sugar—perhaps a little curaçao to take the edge off the lime. Now we’re getting somewhere. This is a superior cocktail, and we might be able to get away with including those little tweaks in the free-for-all of the Gimlet formula. Except for one thing—we just reinvented the Pegu Club Cocktail. “Gimlet Cocktail: the libertarian’s delight” at cold-glass.com : All text and photos copyright © 2011 Douglas M. Ford. All rights reserved. Fill up with chilled plain water, add 1 ice cube and thin slice of green lime. Don’t use soda water, please. Interesting variant. That one would be touch and go on being too sweet, but it looks from the measures like Baker was using a little restraint, with both the sugar and the lime flavor. I’ll have to give that one a try; thanks for posting it. As for preferring the Roses’s to fresh lime, well, yes, I was so shocked and amazed at discovering this preference that I almost didn’t write that part. But then I’d be a closet Rose’s Gimlet Drinker, which seems worse than being any other sort of Gimlet Drinker, so there it is. My father is probably wondering who took over writing the blog, and what they did with his son. But as you might guess, I did up a lot of Gimlet variants in prep for this article, and had plenty of opportunity to validate that choice. And the more Gimlets I made, the less I found myself wanting the fresh lime versions. Very strange, indeed. Gin-based cocktails with either lemon and lime really float my boat. Tom Collins, Gin Fizzes, Gin Rickeys, Gimlets, G&Ts with a slice, etc, etc. are all delicious and seriously refreshing cocktails. My understanding of a gimlet is that it doesn’t have anything fizzy in it and is a very strong mix of lime juice and gin, with a little gomme to take the edge of the sour note. So similar to the classic version you mentioned. They’re a great drink for summer evenings, in lieu of a G&T. I agree about the soda—that Embury reference equating the Gin Rickey and the Gimlet really caught me by surprise, though I’ve come across other references suggesting “topping up” the Gimlet since. Doesn’t seem right to me. Drank minimum fifth vodka a day 35 years Now sober 9 years. Still enjoyed your writing here and the way you craft your words and sentences. Congratulations, that is a remarkable achievement. I’m glad you’re still able to enjoy this blog—I’ll keep you in mind as I write. I don’t think of the Gimlet as anything like the Rickey since I don’t sweeten my Rickeys at all. Beyond that, I’m firmly in the Rose’s camp myself. I use it in exactly two drinks, Gimlets and Kamikazes. Anything else and it’s a disaster. Also, you are right, you just can’t spend an evening enjoying Gimlets—they do wear out their welcome quickly. Finally, have you tried any of the other commercial lime cordials that compete with Rose’s? I’ve had luck with none of the one’s I’ve tried. Thanks, Doug. I haven’t looked under every rock, but Rose’s seems to be the only lime juice in my area, so I can’t compare. Google seems to know about some recipes for home brewed lime cordials and syrups, and it might be amusing to try that one day, but for now it’s only Rose’s. 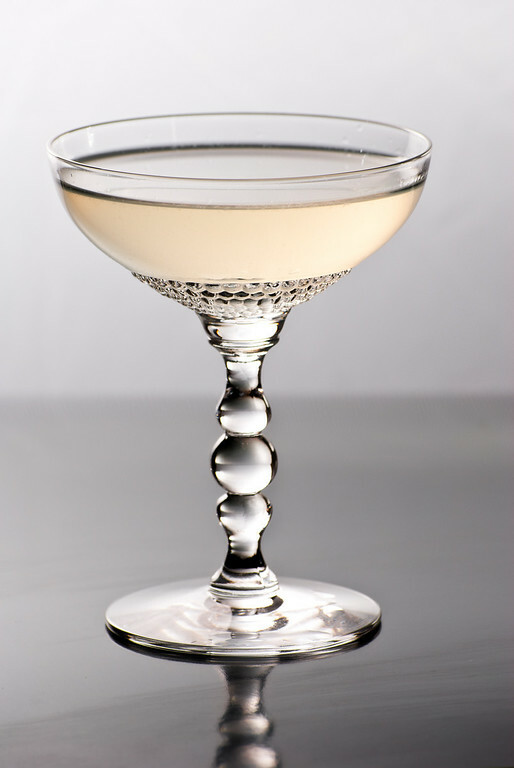 It would be an interesting exercise to try and create a more true tasting Gimlet without using Rose’s. Shooting from the hip here, but maybe something like Gin, Lime, Simple, Pineapple Gum Syrup and maybe a tiny splash of Smith and Cross rum for some funk? Yes, that would an amusing attempt—and anyone who pulls it off will get quite famous for it, I suspect. I think I’d start along the lines you suggest, with trying to make a first-rate sugar syrup and lime infusion, with extra ingredients to manage the more subtle flavors. It would be a bit like making your own bitters, I suspect—finding just the right exotics to make it work. It’s a very interesting idea. While I find nothing wrong with trying this, I suspect almost any cocktail lover has better things to do with his or her time than trying to duplicate the taste of Rose’s with other ingredients! If you are inclined toward the taste of the Rose’s Gimlet (or, The One True Gimlet™. Summon the Inquisition upon those who disagree), then there is already a great ingredient you can use that is a perfect match, widely available, and cheap. It’s called Rose’s…. Interesting article – just discovered your blog through a “Share” by Dry Fly about your “Last Word” cocktail. I’m a gimlet lover, but I don’t understand your dislike of the 50-50 version. As Raymond Chandler wrote in “The Long Goodbye,” “It beats Martinis hollow.” (Quoted from Paul Harrington, “Cocktail,” p. 96). I’m going to enjoy reading your backtrail of posts. Thanks! David, I’m glad you found Cold Glass, and I hope you’ll enjoy what you read. I’ve seen that Chandler quote. I’ve tried the 50-50 Gimlet, or part of one, and it is much sweeter than I can handle. Rose’s is interesting, but I don’t love it that much! Or maybe I’m just getting old. Have you ever heard of a Gimlet being made with two nuts ( Hazelnuts or Cashews) as the “Mandatory” garnish ? I had a customer come in and tell me that we weren’t mking a “Proper ” Gimlet , without the two nuts in it. never heard of it myself, and can’t find any reference on the internet. I have heard of a Gimlet with a nut garnish, hazelnuts I think, but I’ve not heard of it as a requirement. Perhaps it’s a local dialect; I wonder where your customer was from? I really don’t want to be a party-pooper here, but it seems like you really are talking about a 5th graders watercolor like a Monet. It’s rather simple…. make the drink. I don’t particularly know how it is you managed to make this that complex, but, at the very least, I enjoyed reading your post, if only for a laugh than for any real information. You’re very welcome. I know bloggers always search for opportunities to improve their writing. I’ve never tried making my own lime cordial; I’ll have to do that one of these days, and your comment is just enough inspiration to get it high on my to do list. Thanks!